MOUNT VERNON — Melt the winter blues with a laugh out loud comedy at The Alcove Dinner Theater. “The Savannah Sipping Society” is the next installment for the 2018-19 season. The show runs from Feb. 1 through March 2 with a special show only Saturday matinee performance, Feb. 16. The Alcove Restaurant is located at 116 S. Main St. Directed by Bruce Jacklin, this delightful, laugh-a-minute comedy, surrounding four unique Southern women, all needing to escape the sameness of their day-to-day routines and are drawn together by Fate – and an impromptu happy hour, a news release states. They decide it’s high time to reclaim the enthusiasm for life they’ve lost through the years. Randa, (Mary Spence) a perfectionist and workaholic, is struggling to cope with a surprise career derailment that, unfortunately, reveals that she has no life and no idea how to get one. Dot, (Susan Moreland) still reeling from her husband’s recent demise and the loss of their plans for an idyllic retirement, faces the unsettling prospect of starting a new life from scratch — and all alone. Earthy and boisterous, Marlafaye, (Maureen Browning) a good ol’ Texas gal, has blasted into Savannah in the wake of losing her tom-cattin’ husband to a twenty-three-year-old dental hygienist. The strength of her desire to establish a new life is equaled only by her desire to wreak a righteous revenge on her ex. Also new to town, Jinx, (Patti Goeppinger) a spunky ball of fire, offers her services as a much-needed life coach for these women. However, blinded by her determination and efforts to get their lives on track, she overlooks the fact that she’s the one most in need of sage advice. 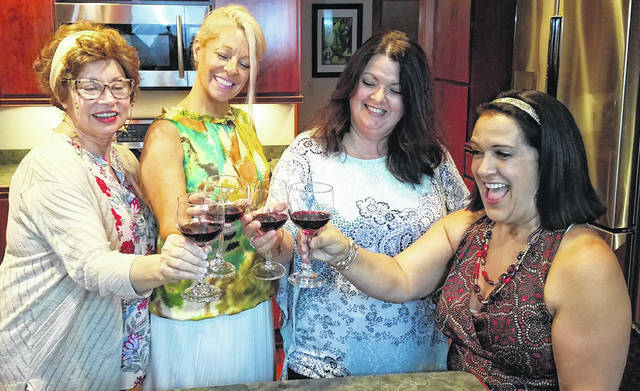 Over the course of six months, filled with laughter, hilarious misadventures and the occasional liquid refreshment, these middle-aged women successfully bond and find the confidence to jumpstart their new lives. Together, they discover lasting friendships and a renewed determination to live in the moment — and most importantly – realize it’s never too late to make old new friends. The production staff includes Jennifer Walters as stage manager, Desmond Wall as stage crew, Joe Bell constructed the set while Rodney Cheek designed the sound. Ian Ernsberger created the lighting plot. Scott Swingle is the sound and lights operator. Megan Evans is the production manager. Tickets may be purchased on line at Alcoverestaurant.com or MTVarts.com. Menu selections and prices are on the websites.